Considering that hot air balloons are the oldest form of aviation, one rarely expect something “new” or “exciting” to happen with this mode of transport. However, a world first was introduced to ballooning and aviation in December 2016 – Flying with falcons. The idea was to have a falcon (and its handler) go up in the hot air balloon and demonstrate how these animals operate and function at altitude (4,000 ft.). Fellow passengers would be able to see up close how the world’s fastest animal flies and lines up a target as it aims to strike. At first the idea seemed ludicrous, as all other world firsts seem at the time. Thanks to a few minds that worked in tandem, this idea became a goal which in turn became a reality. His Highness Sheikh Butti Bin Juma Al Maktoum, Adam McEwan, Peter Bergh, Howard Waller and Peter Kollar were the masterminds to craft this idea. The journey started in the Scottish Highlands in February where the falcons were hatched. Scotland was ideal as the cold temperature helped the falcons develop stronger muscles for flight in the desert climate. Falcons are raised using “imprinting” and are fed by hand after they have hatched. 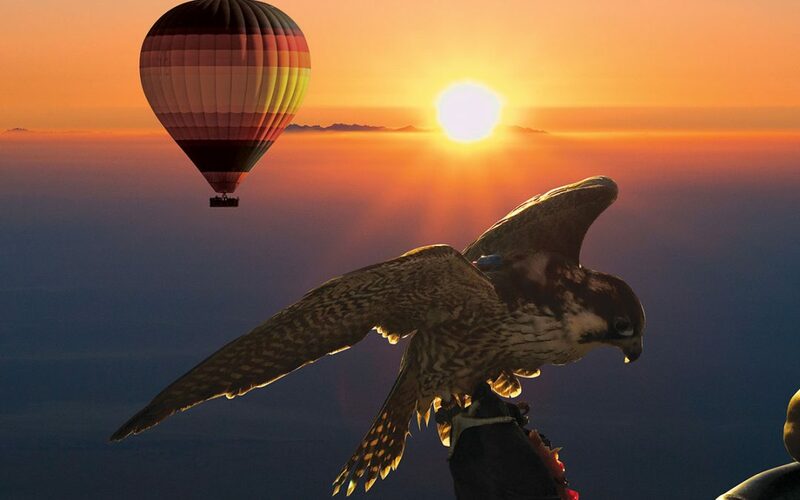 Once the falcons reached maturity, after 60 days, they were transported to Balloon Adventures Italy where they had their first encounter with a hot air balloon. Many challenges would arise throughout this training period, but the biggest one was how these birds would react to the fire of the burners in the balloon. The instinct of all animals is to flee when the see, feel or hear fire. This would be a crucial part of their training. Peter Kollar, Balloon Adventures Chief Pilot and Peter Bergh from Royal Shaheen through their expertise achieved amazing progress with the birds. As August came, it was time to move to Dubai and for the falcons to get accustomed to their new home. Thanks to air conditioning, the birds won’t have to endure the desert climate on a permanent basis and they would be able to adapt quickly and easily. 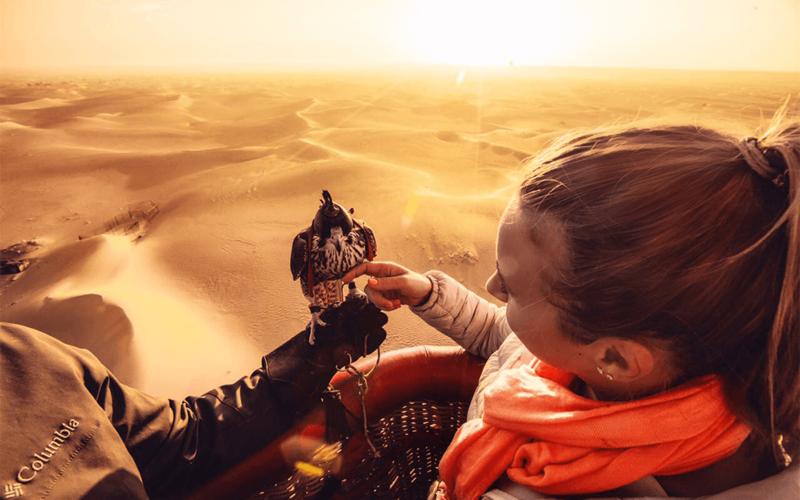 The first flight was ready to be undertaken over the Dubai desert. The baskets are loaded with people to see how they will react with tourists and their cameras. The maiden flight has taken off and it is a great success. The falcons fly and interact in a better manner that could have ever been expected. Guests have the opportunity to hold the falcon while flying at altitude and experience these majestic creatures. Get up close and personal with falcons in Dubai. 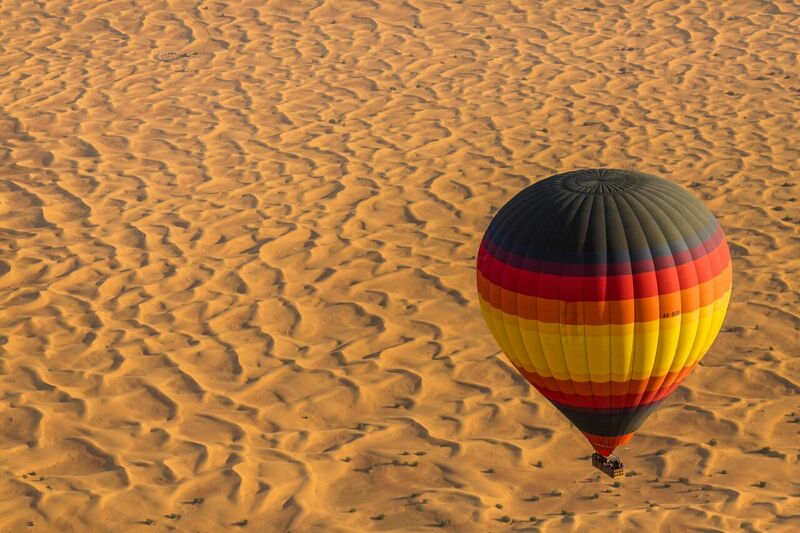 Experience this world-first airborne adventure on all Balloon Adventures Dubai flights.